The Harp has been the most popular handcrafted Instruments that the children make in our program. This craft has recieved awards. I hope that you and your church even if you don’t choose to do our program incorporate this craft along with the mini lesson with you children. It is great to use with a Sunday School class. If you would like the Mini lesson for this instrument project just contact Pastor Dan and he will direct you to the page you need to go.shalomtoyou321@aol.com in subject box place Sunday School Harp . Using the harp we teach the children about the Trinity. God ordained which musical notes will harmonize with each other. Prophecy could be instrumental as well as vocal. Saul met a group of prophets who apparently sang and accompanied themselves on instruments (1 Sam. 10:5, 6). David appointed 228 musicians to “prophesy with lyres, harps, and cymbals” (1 Chron. 25:1-7), music which also seems to have had an improvisational character. While listening to the music he was given the prophecy (2 Kings 3:15). The term selah, which occurs 71 times in the Psalms. Hand Crafting the “Harp” Nylon string or Brass wire string craft. 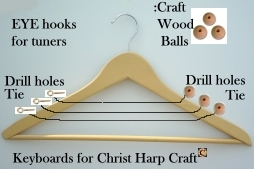 Two ways for you to choose.Click on the harp picture below to see the Nylon string harp and the instructions to craft this harp. I recommend the nylon fishing line harp over the brass wire harp. They both have a unique tone and you may want to craft both of them. In the Keyboards for Christ Music Program the Children learn about harmony and chords using the harp that they hand craft. Depending upon time you can make a harp of 3 strings, 6, or 7. Each string can be tuned to the sound of the notes on a piano keyboard. Like the first string C and the next one E and then G and so on. If you are using a Three string project then C E G makes up a C major Chord. Also you can use three types of tunings. For example if you have a group of 9 children have three tune their harps to the C chord, CEG and then 3 tune their harps to the F chord FAC and then finally three tune their harps to the G chord GBD. Then in a lesson during the ensemble time you can acually play a song with the kids. I also like to have if you are using keyboards the children play each note one at a time and the other group of children answer back that note on their harp. Piano plays C kids on harps play the C note back. The harps will go out of tune and this also helps the children to train their ear in the sounds of each note. 1. Wooden cloths hangers I purchase these at the dollar store usually. Recently at Krogers I purchased 12 for a dollar. Many places have them and even at flea markets and garage sales. People also just donate them to you to use. Remember to take the hook off them. 2. Small eye let’s (Picture below) These work as the tuners for the harps. After the holes are drilled and the wooden Balls are tied you run the line through the hanger and tie it at the Eye hook. 3. I have used both wire and nylon fishing line. I like them both, it is better to experiment for yourself. Wire usually 28 guage that you can get at any hardware store. This wire is used in crafts and can also be purchased in colors. It is around 3.00 for 40 yards or 10.00 for a 5 lb spool. You can also purchase wire via the Internet just type in 28 guage brass wire in your search engine and select the compnay you want to by from. 4. Paint or stickers. You might just want to simply “Stain” the harps in the natural wood. This also looks great. 5. Q-tips to use for painting. Instead of paint brushes I use these. But brushes also work fine. 6. Small washers if you are not using the wooden balls. Wooden balls can be purchased at most craft stores. Harp Wooden hangers, eye hocks, wire, or nylon fish line, paints, Q-tips for painting. Pre drill the wooden hangers and place the I hocks at the top. You will drill 3 holes at the bottom. The wire strings are pulled through a small washer so the string will hold then the strings are tied around the I hocks at the top. The children should paint the harps first and then the teacher will strings them or the parent for the children to take with them at the following weeks lesson. The teacher should make a harp ( string it during class to show the students before they start painting them.) Get paint that is water/soap clean up, place down papers on a table and let them use the Q- tips for painting. The wire for the harps can be purchased at a craft store along with the paints. 1. If you can pre drill small holes in each side of the wooden cloths hanger. The right side will be where you place the eye hooks ( Tuners) and the other side is where you will tie small washers to the brass wire that you will pull through the hole that you drill. 2. After the child pulls the wire or fish line through the hole and up to the tuner ( eye hook) then you can paint the harps. I remove the HOOK of the hanger and the child can use it to TUNE the harp since the Eye hooks are somewhat hard to turn with your fingers. 3. Q-tips work very well for brushes and the paints you can purchase at any local craft store. This craft the child cannot take it home until the following week if that is your choice. I recommend that all instruments stay ata the program until the final graduation or parents program. This way you can continue to use them in the lesson plans. As in all the other HANDS ON lessons it is very important that you incorporate Biblical Scripture into the craft. 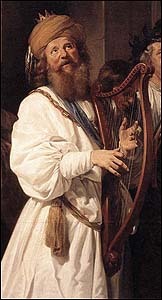 You may use whatever you would like but I recommend about King David and his harp. In ancient times the harp was played with the hand while walking. It had multiple strings and sometimes a sounding board, as with this harp excavated in the ruins of ancient where Abraham originally lived. Notice this harp has 11 strings with a nicely ornamented sounding board with a ram’s head at the end. “After that thou shalt come to the hill of God, where is the garrison of the Philistines: and it shall come to pass, when thou art come thither to the city, that thou shalt meet a company of prophets coming down from the high place with a psaltery, and a tabret, and a pipe, and a harp, before them; and they shall prophesy: And the Spirit of the LORD will come upon thee, and thou shalt prophesy with them, and shalt be turned into another man.